Upset by the energy crisis in Tajikistan, international organizations operating under the UN aegis intend to appeal to donor-states to help them thwart a humanitarian catastrophe in this Central Asian country. UN World Food Program Director Zlatan Milisic claims that Tajikistan is in grips of a grave food crisis as well. WFP specialists believe that at least 500,000 citizens of Tajikistan cannot afford minimum daily rations (2,100 kilocalories) these days. Energy crisis that exposed problems of Tajikistan in all their ugliness is meanwhile worsening. Water in the Nurek Reservoir (of the namesake hydroelectric power plant that accounts for a larger part of all electric power production in the country) is down to a critical level. Estimates vary, but sources claim that it goes 0.3-1 meter down every twenty-four hours. Unless something is done about it, specialists say that the hydroelectric power plant will have to be shut down, and soon. The republican Energy Ministry complains in the meantime that no electricity is coming from Uzbekistan. Referring to domestic shortage, the neighbor country suspended electric power export to Tajikistan on February 4. Turkmenistan tried to come to Tajikistan's help at first and doubled export of electric power to 7 million kWh. 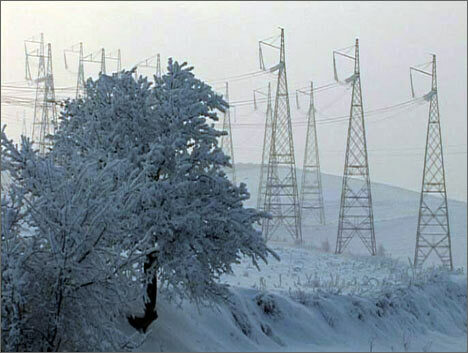 On February 10, however, Turkmenistan itself was hit by an unprecedented cold front and brought export down to 3.5 million kWh again. Electric power consumption is limited all over Tajikistan. Not even Dushanbe, the capital, was spared the discomfort this time (other regions of Tajikistan have been living without electric power for months). Asia-Plus news agency reports that the mayor of Dushanbe demanded that the municipal services and republican structures made electric power available to the population in accordance with the schedule set by prime minister (5 to 10 a.m. and 5 to 10 p.m.). What Tajik enterprises still function are running in the red because of the energy crisis. Most of them shut down, their personnel told to stay indoors. The population is therefore left without the principal source of income. Damage to the national economy is estimated at over $250 million. Local media outlets are affected by the same lack of electricity and so are publishers - not to mention the electronic media. Frozen water-pipes leave the population with no other option but drink water from rivers. Women and children in settlements ferry water in every conceivable container from bottles to buckets to gasoline canisters. Every man for himself. The family of Birob Olimova from the settlement of Duoba numbers 16 people. They all live in one common household. The Olimovs call it a day when the electric power generator burns all gasoline. Turning in is all that is left them. Olimova has four adult sons. One of them works at the local cement factory, another is in Russia, and the remaining two are unemployed. The son working at the factory is paid 400 somoni (about $130) a month, which is essentially all of the family budget. This winter, the money is barely enough to buy fuel. The Olimovs use coal to heat the household and a sackful costs 15 somoni (enough got a couple of days only). The generator cost 250 somoni. The Olimovs spend 7 somoni a day on gasoline for it. That leaves the family without anything to buy food with. The Olimovs forgot the taste of meat long ago. They mostly subsist on bread and rice, sometimes on home-made jam or something like that. Temperatures rose some in early February but remained below zero all the same. Children are kept indoors. One Jabir, teacher from the settlement of Varzob, claims that more than every second student misses classes. Maternity hospitals are in trouble. Nurses fill plastic bottles with hot water and out them by infants for warmth. Pregnant women refuse to make the trip to the nearest maternity hospital where the temperature is not much better than outdoors and deliver right at home. Doctors are disturbed by this tendency. "That's risky," a nurse said. Sabir Kurbanov of UNICEF confirmed in an interview with the BBC that some infants did die of exposure caused by lack of electric power but official authorities never confirmed it. "We are getting reports from various regions of Tajikistan these days that the death rate among newborns is up," Kurbanov said. Milisic warns that the crisis will have long-term consequences for Tajikistan. "Cattle is butchered because the population needs to eat. What will happen to these people tomorrow? Cattle is often their primary source of income and nourishment," he said. In other words, the mechanisms of fighting impoverishment designed by the population itself are being actively dismantled these days. The crisis will extend into string unless urgent measures are taken. Citizens of other Central Asian countries (Uzbekistan, Kyrgyzstan, and Turkmenistan) encounter similar problems. On the other hand, humanitarian catastrophes in these countries are not feared, obviating the need to airlift relief aid there. It is still snowing in Afghanistan. 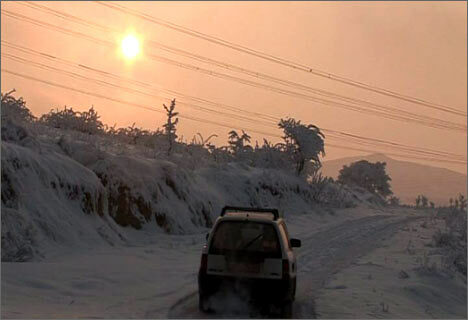 Temperatures in central and western provinces plummeted (to minus 35 degrees Celsius in some areas).